About a year ago, my band was playing a few gigs in Melbourne. 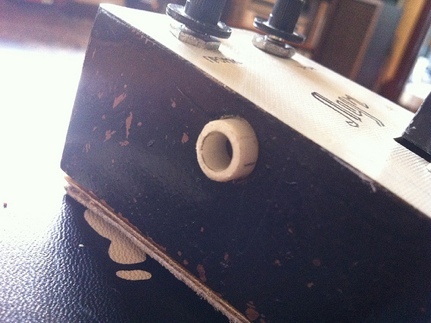 I was at my mates place enjoying a delicious chicken burger when I got a text from my singer, showing me a photo of a weird looking Russian made guitar pedal he’d found in an antique shop. It was described as being like a Big Muff, but little. It looked pretty interesting and as it was only $90, I told him to grab it for me. When I got it, I was a bit dubious on how it would sound as it was VERY crudely made. Case in point… the cover was a bit of kitchen counter top vinyl written on in black ball point pen… and the knobs looked like they’d been hacked at with a butter knife. 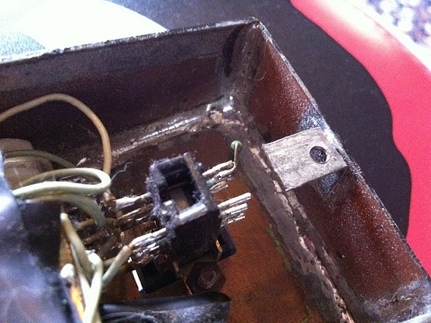 The ‘footswitch’ looked to be some sort of electrical light switch made out of plastic. Very fragile, and would probably smash to pieces if stomped on. But it got better. 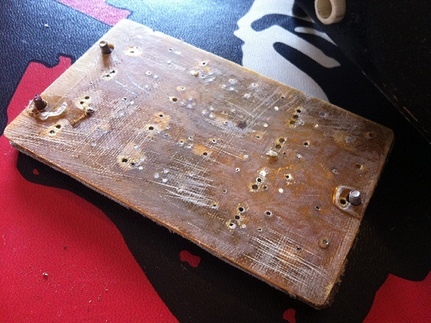 The base plate underneath the vinyl was a piece of PCB, probably ex-Russian military. 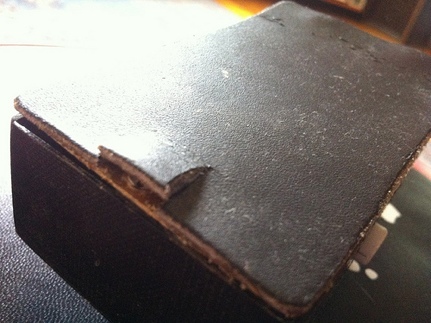 Then I saw what the casing was made of… it looked like cheap tin that had been hammered flat and soldered crudely together, then hand painted black. The circuitry consisted of a tiny PCB with some weird chips etc. I had Tim from Tym Guitars look at it and he said it didn’t make much sense. By rights, this pedal shouldn’t work. 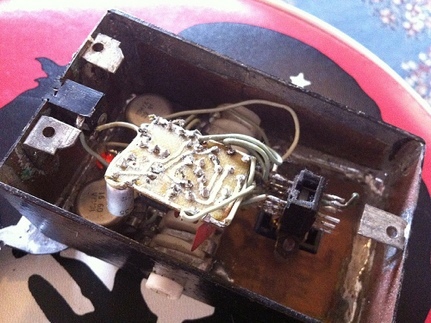 Then the moment of truth, I plugged it into my Tym Goldentone combo and a glorious, thick distortion sound erupted from my amp. 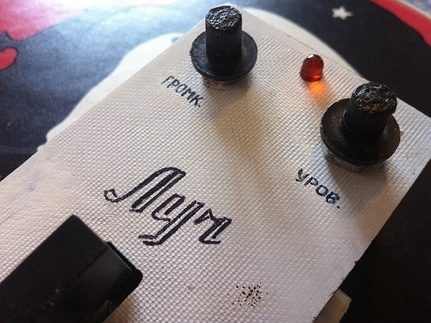 Sort of a cross between a MXR Distortion plus but with the tightness of a ProCo Rat. It is honestly one of the best sounding pedals I have. 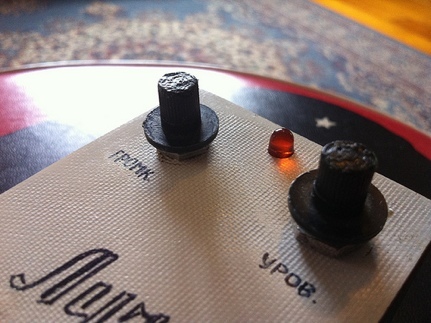 The knobs are volume on the left, and I’m guessing the other is supposed to be gain but it doesn’t actually work. It’s stuck on full. Which is fine… it just sounds so goooooood. 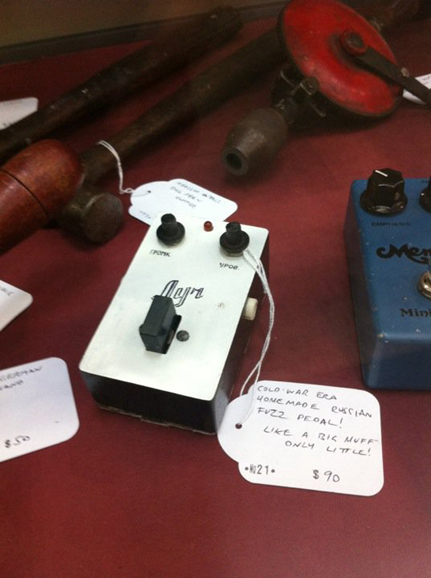 So… I’m not sure who made this pedal, but thanks very much. I’m very much in love. 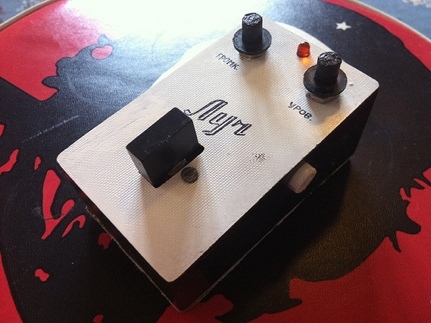 Tim and I are in talks of maybe making a run of these as the first official guitarnerd pedal. I’d love to try and match the look and feel of this, along with the great sound. I’ll keep you posted. Here’s a recording I’ve made using the Nyr. 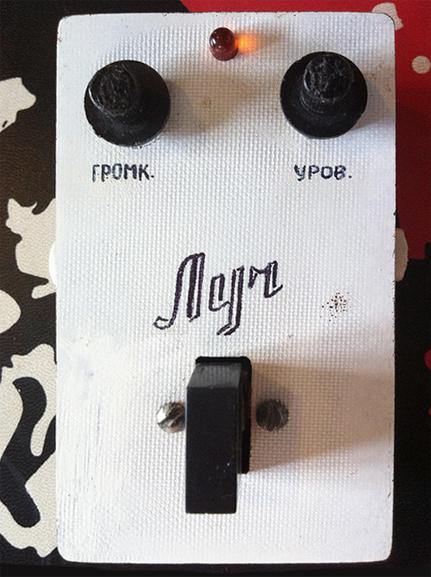 The knob on the left (громк, shortened from громкоговоритель) is “Speaker” and the one on the right (уров, from уровень) is “Level”. Although I thought the “Nyr” looks like someone writing their name in the Gibson font as a bit of a joke, луг actually translates to “Meadow” or, in the twee English sense of the word, “Green”! It’s a bit of a leap, but there are two pretty famous green distortion pedals out there, the Sovtek Big Muff or, and from the description of the circuit and the shade of green this is more like it, the TS-808 Tubescreamer or it’s relative, the Maxon OD808? You going to post up any sound clips ? Nice, yeap, get Tim to do some pedals up. My bank account details are as follows………………. That sounds awesome ! Sign me up ! Damn I want one! Badly! 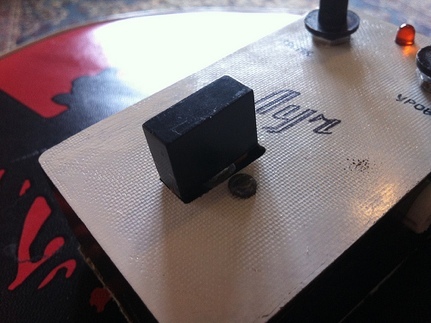 You should do a run of guitarnerd t-shirts to go with your first release of Guitarnerd pedals you know…. just sayin…. hahahaha. What a great story! I definitely would like one!!! Great blog by the way, I’ve been addicted to your site for more days than I’d like to admit…. Looks like it sounds! Really rad how hand made it looks, would be very interested in getting my hands on one!